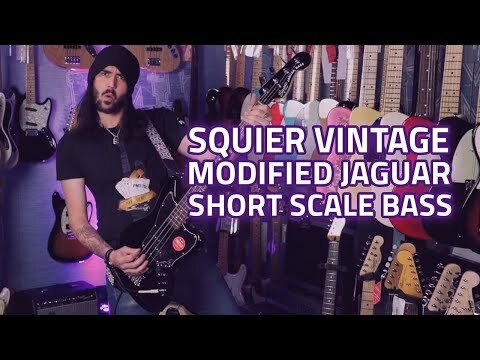 Squier Vintage Modified Jaguar SS Bass Guitar, Black Short-scale neck, big twin-pickup tone! Don't let the condensed size of the Squi..
Short-scale neck, big twin-pickup tone! Don't let the condensed size of the Squier Short Scale Jaguar Bass convince you that it can't hold its own on stage - this thing rocks! As the name would suggest, Squier have taken some of the Vintage Fender bass designs of yesteryear and converted them for the modern player at a very reasonable price point. Out the box, the Vintage Modified Jag Bass comes modded with a hybrid blend of split single-coil Precision Bass and Jazz Bass pickups. 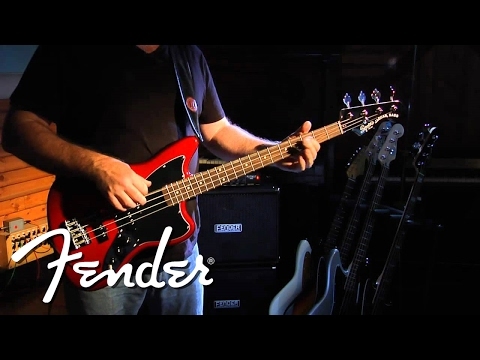 Two iconic Fender basses that growl and boom when you need them. Sounds great out the box - but a perfect marriage for any bassist that likes to custom fit and tinker with new pickups to make it truly their own. Other features include a sleek offset-waist body and an ultra-slim fast-action 30” scale neck, 20 medium jumbo frets, and a comfortable C Shape profile. This little beast is perfect for anyone with chronic back pain or other ailments that make a full-scale bass difficult or uncomfortable to play. We've heard countless stories from customers that have found Squier Short-Scale basses the perfect solution for injuries like these. The condensed neck size also makes it ideal for learning to play the bass guitar as a student. Buy today from the UK's #1 for Squier Guitars - Voted Best Multiple Music Retailer for 5 years in a row by the MIA! Amazing guitar for the money. Out of the box the setup is pretty decent and plays well. It's nice and light and due to its size plays lightning fast. The tone on this thing is stunning for the price. It sounds more like a £700 guitar. I've been playing about 15 years and know a cheap sounding guitar when I hear one.... Well done Squier cos this is not a cheap sounding guitar. The only minor problem I thought the strings felt a bit flappy. I bought some 100 slinkys and it improved quite a bit. Overall, amazing for the price.